Also available online, but you will have to pay for P&P. POCKETOILET™ utilises advanced technology originally developed to relieve the problems of astronauts in space. The material will absorb urine up to 30 times its own weight. 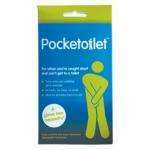 The pocket toilet contains fluids safely whilst you are on the move. Designed for urine, the rapid performing super absorbent lining converts the fluid into a secure gel for safe disposal. POCKETOILET™ also helps contain odours and prevent germs from spreading. Ideal for travel and incontinence sufferers it is also recommended for the elderly and those with impaired mobility. The reinforced opening is easy to hold in use. A single pouch can lock away 400ml of urine, with no danger of leakage, making it suitable for all males upwards of 3 years old. POCKETOILET™ is a glove box necessity for all male motorists who may get stuck in a traffic jam! . Voted hot for being the most awesome invention ever. Can it just be dumped in a layby like the wee filled bottles of Coke it is intended to replace? Can it just be dumped in a layby like the wee filled bottles of Coke it … Can it just be dumped in a layby like the wee filled bottles of Coke it is intended to replace? I just saw it on tv. How us women are supposed to wee in it i am confused but if its winter at least your fingers will get warm from piddling on them. pmsl ha ha X)I just saw it on tv. How us women are supposed to wee in it … pmsl ha ha X)I just saw it on tv. How us women are supposed to wee in it i am confused but if its winter at least your fingers will get warm from piddling on them. Oh get real, who in their right mind would use one of these stupid things?? Just pull over, get out and have a pish, simple!! I can't see this catching on. I was once at a Leeds RL match when blokes were just peeing where they stood and it ran down the stands to the front. People who care will find a real place to wee, those who don't will waz anywhere. Oh get real, who in their right mind would use one of these stupid … Oh get real, who in their right mind would use one of these stupid things?? Just pull over, get out and have a pish, simple!! That sounds like a great option in rush hour in the City Centre. Theyve been using things like this for awhile in hospitals. Clever piece of kit. Heh heh heh! I am assuming you insert the bag into the sock to give it structure rather than deficating directly into the sock & just using the bag for disposal purposes? Heh heh heh! I am assuming you insert the bag into the sock to give it … Heh heh heh! I am assuming you insert the bag into the sock to give it structure rather than deficating directly into the sock & just using the bag for disposal purposes? your taking the ****, they use the sock to wipe !!! hang on a minute , my cat has similar stuff in the cat litter tray , and its like £4 for a 1gk bag !! Turns urine into a solidified gel that can double up as a gift to give to others. This is all very well - but does it come with curtains? Cos, I reckon it won't be nice to be caught out with your wanger in your hand whilst sitting in a car - next thing you know I'll have Stan Collymore & George Michael gawping in through the passenger door. Not only that when I go for a slash - they call people in on overtime at the local sewage works - not sure this has the capacity for a bison bladder like mine. Also...these are no good for a No2 - I tried ...really messy....I'm still trying to get the marks off the upholstery in our Picasso. Up to 400ml? I'm sure I've taken tiddles in the past that could easily have filled a pint glass, so this'd just about manage. Hot (or urine warm, at least) for me! Why do I get the feeling they'll be selling a lot of these to dedicated Warcraft players? 400ml isn't much to be honest. OVERFLOW! Wouldn't like this to land on my head at a festival if someone in the middle of the crowd decided to launch it like they do when they pee in a bottle or cup and throw it!! This would be like being hit by a wet brick!! I check all pockets before any washing load. does this go back in your pocket after use? We just keep a potty and a loo roll in the boot of the car. Supposed to be for the kids but im not proud if im desperate. Oooh a perfect secret santa gift, hot from me!! Everyone should be issued with a free one at the music festivals instead of having thousands of people chucking pint glasses full of pee around. Useless imo, if youre bursting so bad you cant wait and have to use one of these then your talking full bladder which will triple or quadruple the 400ml capacity. Hmmm might be handy to keep next to your toilet in case you run out of toilet. Is this being publicised now to coincide with the release of Black Ops? careful now! i ended up with athletes ar**. With a bag that big you can have a number 2 as well!